Super Easy Shrimp Dip is so easy to make, it’s almost embarrassing! Three ingredients, that’s it! Well four, if you want to get fancy and top this dip with some sliced green onions or if you want to really get technical, five ingredients, if you count the Townhouse crackers I serve this dip on. This dip is easy to make but you won’t be embarrassed to bring Super Easy Shrimp Dip to any party. It will literally disappear before your eyes. This recipe has been around for years..making this dip a family holiday and anytime favorite. You can whip this dip up, in less than 5 minutes. My son Bob loves this shrimp dip. In fact, one year I made this dip to bring to a gathering him and his wife Kim were having at their house. I didn’t have anything to make at home so on my way to their house I stopped at the store and picked up what I needed. All four ingredients. I whipped up the dip and plopped it down on the table. I opened the box of crackers and left the kitchen. A few minutes later Bobby said, “Mom, did you make the shrimp dip?” I said, “Yes” Bob said,” You haven’t made shrimp dip in for-ever…I forgot you even made shrimp dip.” Bob and his father-in-law then proceeded to eat the whole plate of shrimp dip. A few weeks later Kim called and asked my for the recipe for my shrimp dip. I told her there wasn’t a recipe but if she had a pen and paper, she could write down the ingredients and the fool proof directions. When I gave her the “list” of ingredients she said, “That’s it!” and I said, “That’s it.” She made the comment that she didn’t even know shrimp came in a can and wanted to know what brand of sauce to use. I told her I always use Hoffman House. Three ingredients is all that is needed to make this yummy dip. On a large dinner plate, spread softened cream cheese with the back of a spoon. 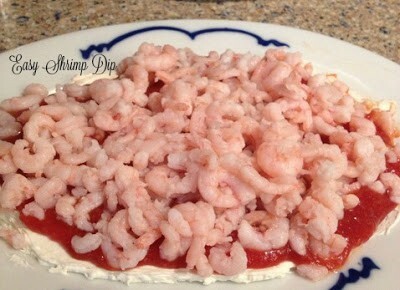 Pour seafood sauce over cream cheese, sprinkle drained small shrimp over sauce. Refrigerate 2 hours. Sprinkle top with sliced green onions before serving, optional. Hungry for more? Try Super Satisfying Summer Snacks and White Christmas Lasagna. Another favorite recipe Fish House Punch. This punch packs a real ‘punch’ so beware!